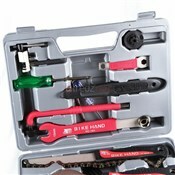 The Bike Hand Bicycle Maintenance Tool Kit has all the equipment you need to make essential repairs to your bike. 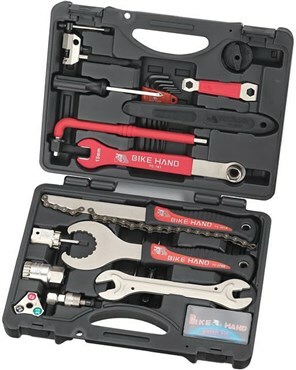 This bike maintenance kit is designed to work with Shimano components, which are found on most frames from road bikes to mountain bikes and commuter hybrids. Don’t let punctures, slack spokes, poor tyre pressure or misaligned brake pads impact your performance and your fun whilst cycling. 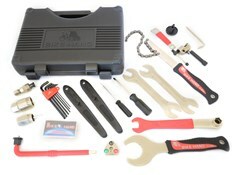 The bike maintenance toolkit makes riding hassle free. In total, you have 18 tools at your disposal for home maintenance or keep it in the boot of your car for essential maintenance at the trailhead. I was pleasantly surprised by the quality of this tool kit, others i have seen do not come up to this standard. The kit contains most of the tools you would need to complete both simple and advanced maintenance tasks. Bought this toolkit to be able to do most and simple jobs on my bikes. Seems to work pretty well, removed the cassette did some cleaning and greasing and general maintenance and all seemed fine. Slightly off putting though and why I have marked it down a touch on quality as there were a number of metal burrs/splinters on the tools, and one of which on opening the box, decided to embed painfully into my finger. Having removed said splinter/burr from my skin, the remainder of the box was fine. The tools were nicely oiled however keeping them rust-free from the factory. Bought this to be able to do extra maintenance on my bikes. I no this is not park tool quality but I did also not pay park tool prices. Within the hour of it arriving I had the cassette of and freewheel regressed. Along with both tyres. I was particularly impressed with the large tyre levers and how much easier they were to remove a tyre. Will be using the other bits and pieces for bottom bracket replacement and regreasing axles over the weekend. The qualty seems ok especially for the price and if anything seems better than I expected. If I can do a full service on my bikes once or twice a year I will be more than happy. Everything you need for shimano, good quality tools and can’t grumble at the price. Joining the general consensus with the other reviews for this kit. It offers brilliant value for money and quality tools. Recently used Bottom bracket removal tools, rear magazine tool, crank arm remover and chain tool. All worked perfectly. This is no mega expensive Park Tool kit but it has everything you need for basic maintenance. The build quality of these tools is far better than the price indicates and better still the case they come in is very good quality. 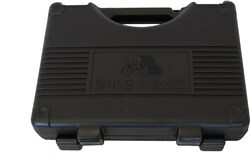 Shimano bike tool kit.. A must have. Great value for money,to do pretty much every job on my bike. Great value for money, and includes almost everything you'd need to perform any home maintenance on your beloved bike. Even comes with a sturdy carry case. My new 18 piece bike tool kit has all you need to do pretty much every job on my bike. Sturdy box with strong hinges and good tools. was a great price and am very happy with it. I look forward to using it and know it will last. overall very happy thank you.